Who doesn’t need a holiday right now? Between school, bedroom-destruction, meal-time madness and a bit of sport there’s not much time to chill out together, let alone plan the perfect getaway. So, you can imagine how stoked we were to simply pack two bags (one for us, one for the kids) and drive 15mins up the road to the Novotel Brisbane to have an inner-city stay-cation! No grand plans, GPS ‘miscommunications’ or porta-cots required and our three year old was super-excited to being heading to a “Hell-tel” for the night. The team at the Novotel were really taking the new family-focus seriously. 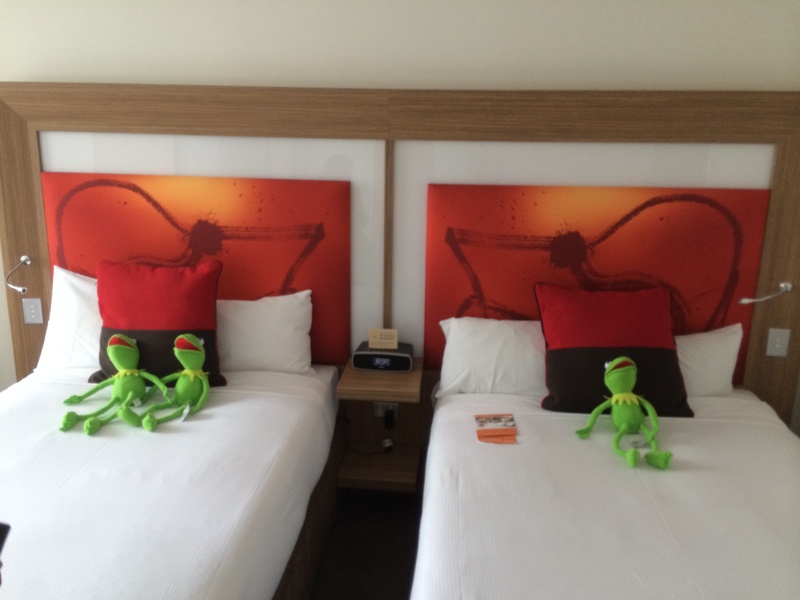 Currently, every child receives a gift upon arrival, so we were greeted with three smiling Kermit-the-frogs in our room after check-in (to coincide with the release of the fabulous new Muppets Movie). This got the kids (1yo, 3yo + 7yo) off to a great start, kept them occupied and added to the magic of the weekend. A dedicated play area with toys, books and a big-screen TV. FREE breakfast (did someone say ‘buffet’?!) for children under 16yo. FREE stays for two children (up to 16yo) when sharing their parents’ or grandparents’ room. A 5pm late checkout – completely unheard of in our experience! Once we’d unpacked and explored the hotel, we grabbed out three green frogs and hit the cinemas for the new Muppets Movie. 10mins walk away and we were in the heart of the city, grabbing some popcorn and getting psyched for the movie. A couple of hours later we were out and ready for a snack. Once we apprehended our 1-year old who attempted to run to the top of the Queen St Mall we went for a wander and did some shopping. When the feet grew weary we were back to the Novotel for some ABC 4 Kids down-time in our room before dinner and to unwrap the SECOND Muppets-themed gift – three show bags chock full of cool Kermit clothes and trinkets for them to fight over look astonishingly cute in for the rest of the weekend. With the Muppets Movie focus, we lucked out at dinner – green everything! While the kids had green slushies, we hit up some Kermit-themed cocktails or ‘mummy and daddy drinks’ as we still call them while the boys had fish’n’chips and green tortellini. The kids were happy with the food on offer and there was some colouring in books and stories available if needed. Our kids were into the books for a bit…until they recognised the life-size posters of Mr Badguy from the Muppets movie. Mr Badguy was no good guy, so our 1yo (who happens to be built like a 24-year-old front-rower) decided to run across the dining room floor and tackle him to the ground. No word of a lie. Fortunately it didn’t seem to bother anyone and he was – as usual – unscathed and undeterred. We decided we needed to extract the younger ones before Miss Piggy was also assaulted and retreated to the parents room for some trucks and TV…truly a lifesaver! There’s something about knowing you don’t have to wash up, answer emails, clean the yard, vacuum or make the beds in the morning that makes you sleep so much better than when you’re at home. After staying up a bit too late watching movies from our lush bed, we got our young charges up and dressed and hit up the buffet breakfast downstairs (kids under 16 FREE!). Between the Banana Bread, Danishes, Coco Pops (many, many bowls), bacon, eggs, mushrooms and chippolatas we managed to fill ourselves up for the day without causing a scene. We were now prepared for what our boys were considering to be the highlight of our ‘lil stay-cation – the pool. While it wasn’t warm it was swimmable and the kids loved it! Dad (me) eventually hit his limit and we headed back upstairs to get changed and – thanks to the 5pm late checkout for families (amazing!) – venture into the city again. Mum did some shopping, dad got a coffee and the kids soaked up the city vibes. There was a Dora show on in the mall (we decided not to tackle her), amazing chocolate at the Noosa Chocolate Factory, big sales at a number of stores, the new Top Shop and space for the kids to let off some steam at King George Square. That pretty much brought our stay cation to a close. We were able to head back to the Novotel Brisbane, pack up, spend 15mins look for ‘lamby’, checkout and head home…15mins down the road. We were actually surprised at the effort that had been made into making our kids feel at home. The biggest impact was that the little touches made you feel like your kids were meant to be there and would not be seen as impostors in the hotel. The play area, gifts and simple little Muppet touches really built up to a nice feel and the kids certainly felt at home. We’d only ever thought about an overnight stay in the city for us as a couple, but now we see how it actually makes sense to take the kids, especially if they’re FREE anyway! Staying a few blocks from everything somehow changes your perspective on the Big Smoke and you slow down just enough to enjoy it more and do the things you don’t often take the time to when you don’t feel like it’s ‘home’. So, if you’re in need of some time out but are short on time, try out a stay-cation. We’d recommend you give Novotel a go as they’re going to make the first attempt as easy as possible and the kids will be made to feel really welcome. Thanks to the team at Novotel Brisbane and let us know if you get to try it out!